The Internet is our "Wild Wild West" these days, and the next frontier is our fear of intimacy. Mohsin Shafi a Pakistani artist and Andrew Purchin an American artist, met by fluke in the digital cloud. "And" was captivated by the line work forming eyes on the toes of "Sin’s" feet in his profile pic. Through the cadences of their voices, the gestures of their bodies the pair initiated a collaborative creative relationship that contrasts with the conflicts between their cultures and states. 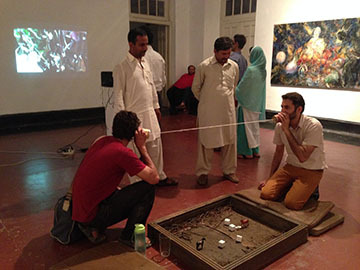 This exhibit's inauguration was at the Zahoor-al-Akhlaq Gallery at the National College of Arts in Lahore, Pakistan. The project continues to evolve and a version of this exhibit will occur in the San Francisco Bay Area. 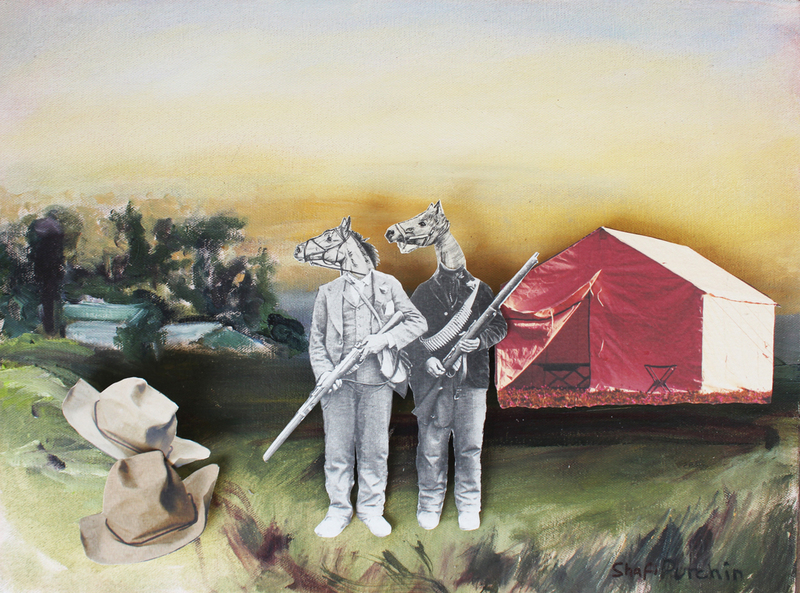 Pictured are collaborative paintings/ collages by Mohsin Shafi and Andrew Purchin from the series "Wild Wild East West." You can also see an image of "The Game of Crustopoly," an installation in which viewers can roll dice to find out who they are in the game. The variables are: East, West, Jew, Muslim, Brother, Sister. At the base of the installation are photos of the artist's legs which have been covered wih dirt and twigs from our respective countries. There are two horses, one is Mohsin's and another is Andrew's. There is the old fashion tin can phone system set up between the two sides. Also pictured is the video, "A Prayer for Shafi," which depicts Purchin's hands tear a dead plant. 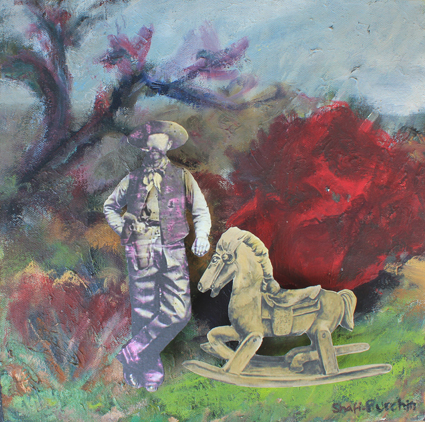 Purchin's painting, "The Gift is depicted on the right.